NEW! Receive a FREE Super Mini personal ionic air purifier with a Super8 Super Life Ionic Air Purifier purchase. Area coverage: 250 – 350sq ft.
SIRIM and CE approved ionic air purifier. Suitable for indoor and vehicle use. Neutralizes unpleasant odours and freshens air. Captures airborne particles and neutralizes viruses / microorganisms. Travel-size and hassle-free with no replacement filter needed. Negative ions are colorless and odorless molecules that can be found in abundance in the mountains, waterfalls and beaches. Studies have shown that negative ions can help alleviate depression, stress, drowsiness, pain and coughs, stop itchiness, improve appetite, anti-hypertension and result in higher alertness. Negative ions increase after a thunderstorm which is why we usually feel invigorated and refreshed. Spending or working long hours in a tightly confined air-conditioned room deprive us of negative ions, we may feel tired, depressed and irritable. A normal human needs millions of negative ions daily. The word ozone is derived from a Greek word ozein meaning "smell". Ozone (O3) is an allotropic form of oxygen (O2) with three atoms in each molecule. The smell of freshness in the air after a thunderstorm is normally associated as a light "green grass fragrance", this is the smell resulting from the formation of ozone. When ozone is in the air encounters pollutants, the third oxygen atom separates itself form the ozone molecule and attaches itself to the contaminant, neutralizing and destroying it by oxidation. 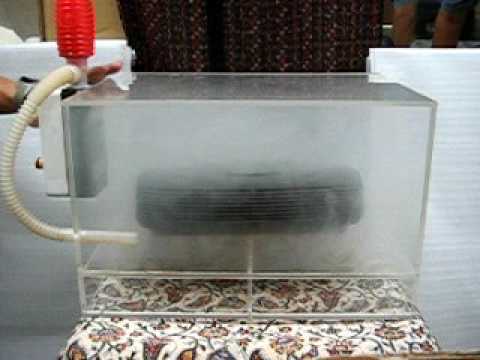 During this process, the extra atom of oxygen is destroyed, leaving only purified oxygen, and the odors and bacteria can be completely eliminated and destroyed. Air is more freshing near to the ceiling. Therefore, Super Life Air Purifier need to place at least 3 feet from the ground, on book shelf, or hang on the wall. After that, simply plug the power adaptor to the unit and press the power switch, switch on is indicates with red light. In vehicles, Super Life Air Purifiers must be fastened securely with the provided small piece of Velcro. Simply plug on the cigarettes lighter adaptor and turn on into 'low' for the safe car operation. Remember, turn off when fueling. 2 operating modes allocates to defferent condition: 1) High: the unit will run continuously 2 ) Low: run for intermittenly, on for 30 seconds, turn off for 3 minutes. Place it on the towel with Super Life Air Purifier upside down. Loosen the 2 screw on side and pull the plates from the units. Hold the collector under warm waters and clean with soapy sponge, then rinse. Use a mild detergent to clean the exterior of Super Life Air Purifier. Reach inside with a small cotton swab dipped in rubbing alcohol and touch the tips of the needle point to remove dust. Irregular hissing sound: needle point need to be clean . Regularly performing maintainance for at least once a month. Place near your nose, help you enjoy fresh air wherever and whenever you are.